24-Aug-2017 -- After spending the night in Winnemucca, Nevada (while returning to the San Francisco Bay area after watching the solar eclipse at 44N 114W), I remembered that this point wasn’t far away. I noticed that it had not been visited since my previous visit to this point, in June 2006, so I decided to visit it once again (in part, to get better photos, and to get an aerial video of the spot). Once again, I drove westward along Jungo Road, and continued as the road turned to dirt. Previous visitors (including I) had faced a round-trip hike of at least 2 miles to reach this point. However, by looking at recent satellite imagery, I figured that there was now a way to shorten the hike. I noticed that - at 40.97606°N 117.98484°W - there is now a narrow dirt road that heads northward, then turns westward, passing just 0.4 miles south of the point. This lead to a round-trip hike of only 0.8 miles. 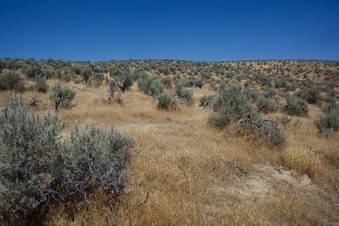 Once again, the point lies near the top of a small, sagebrush-covered ridge. Unlike my previous visit (in late June), there were no ‘Mormon Crickets’ to be seen.